Novichok that poisoned a couple in Wiltshire came from a small bottle found in the home of one of the victims, police say. A bottle was found in a search at Charlie Rowley's Amesbury house and was tested by scientists at Porton Down, the Metropolitan Police said. His partner Dawn Sturgess, 44, died last weekend. Police said they were still trying to find out where the bottle came from, and why it ended up in the house. Assistant Commissioner Neil Basu, the head of UK Counter Terrorism Policing, said it was "clearly a significant and positive development". "However, we cannot guarantee that there isn't any more of the substance left and cordons will remain in place for some considerable time," he added. "This is to allow thorough searches to continue as a precautionary measure for public safety and to assist the investigation team." A spokesman said detectives had spoken to Mr Rowley and were due to speak to him again to establish how he and Ms Sturgess came to be contaminated. 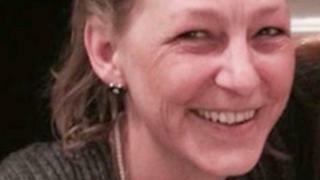 A murder inquiry was started following the death of Ms Sturgess, a mother of three, on Sunday. The discovery of the bottle comes as the Foreign Office announced independent chemical weapons experts would arrive in the UK next week to assist with the investigation. Staff from the Organisation for the Prohibition of Chemical Weapons (OPCW) will travel to the UK to independently confirm the identity of the nerve agent which led to Ms Sturgess's death. The samples will be analysed at "highly reputable international laboratories designated by the OPCW", a spokesman said. The discovery of the bottle is a significant moment. It will help reassure residents in the local area that the risks to their health have been reduced, although the police say they cannot guarantee no more of the substance is left. And it also may provide a significant piece of evidence in trying to establish how Dawn Sturgess and Charlie Rowley came to be poisoned - and what link there might be with the poisoning of Sergei and Yulia Skripal. The working assumption of police is that the bottle was a container discarded after the March poisoning. It may now be possible to establish a scientific link by trying to match impurities in both samples of Novichok to see if the nerve agent comes from the same batch. He said private security guards would join officers on some of the cordons from next week, as the investigation continued. "This will free up some Wiltshire Police officers to get back to supporting day-to-day community policing,"
About 100 detectives from the Counter Terrorism Policing Network are continuing to work on the investigation, alongside colleagues from Wiltshire Police, a spokesman said. Public Health England said the risk to the public in Salisbury and Amesbury "remains low" and no further cases of illness linked to the incident had been seen. As a precaution members of the public are continuing to be urged to not to pick up items such as syringes, needles, cosmetics or similar objects made of materials such as metal, plastic or glass. The advice remains "if you didn't drop it, then don't pick it up", a spokesman said. Post-mortem tests on Ms Sturgess are expected to take place on Tuesday and an inquest into her death is set to open and adjourn in Salisbury on Thursday.